Settled around 1852, this community has a long list of former names. John Hunt donated land for the Pleasant Grove Cemetery. 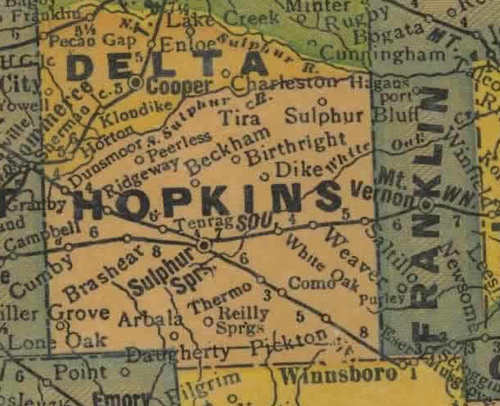 In 1895 the Texas-Midland Railroad built through to Cooper. Later the New Prospect Baptist Church was organized and two months later changed its name to Klondike Baptist Church of Christ. Joel Jefferson Hunt applied for a post office under the name of Klondike. 1964 maps showed four churches, two cemeteries and fifty dwellings at the site.